Looking for Package Deals to Costa Rica? We have those too! Costa Rica, one of the progressive countries in Central America, offers some of the least crowded quality golf courses in the continent. Four million people in population welcome over two million tourists every year. Surrounded by natural beauty, golf courses in Costa Rica meet world-class standards for quality of routing, maintenance and grass conditions. Together with its wonderful landscapes and spectacular beaches, it has been described as to be the “Switzerland of Latin American” and was recently discovered as a fabulous golf destination. Golfing in Costa Rica is nothing but a unique experience. With its desirable weather, amazing mountains and volcanoes, perfect beaches and sophisticated resorts, Costa Rica has now become one of the leading golfing destination in the competition. 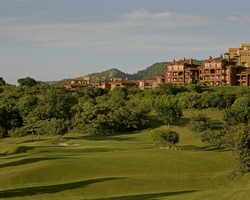 A world-class golf experience awaits golfers at the Robert Trent Jones II designed Reserva Conchal Golf Club. 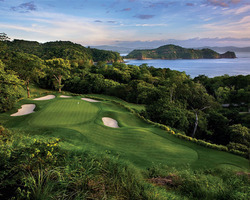 The par-71, 6,956 yard (tips) Championship course is bordered by spectacular nature - the blue Pacific Ocean and the lush forests of the Costa Rican foothills. The course provides golf aficionados with an extraordinary eco-golf experience and was the first in Costa Rica to be recognized by Audubon International for its environmental focus. Each nine meanders through rolling coastal terrain, offering stunning ocean views at every shot and unique tee-to-green elevations. Players of all skill levels will find plenty of challenge playing along the natural lakes and ravines that accentuate the layout, placing a premium on well though-out tee shots and accurate approach shots into large, undulating pristine greens. The par-4 opening hole features a fairway devoid of hazards, tempting long hitters to flirt with the ravine fronting a shallow green. The typical play is a long iron tee shot, followed by solid wedge or nine iron to green. On the 542-yard seventh, tee shots must carry a cluster of trees on the left side of the fairway to offer any change of reaching the generous green in two. Careful players can bail out to the right off the tee, but 13 bunkers will come into play. The round will conclude with three fabulous finishing holes. The par-5, 554-yard 16th, features a downhill tee shot and a panoramic Pacific Ocean view. Number 17, a 212-yard (tips) downhill par-3 plays out of a chute of native jungle canopy to a three-tiered green fronted by water. And to finish a wonderful golf round, the 547-yard, par-5 18th is a wonderful risk-reward hole that plays along water down the left-side. The smart play is solid drive and a mid iron layup to the right-side of the fairway for a short iron to the elevated green. 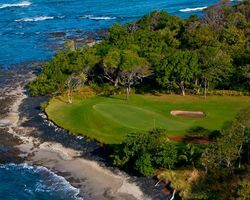 A good drive that lands close to the water offers a chance to hit a heroic second shot to a green that will be receptive to a low draw Location: Northwest Coast of Costa Rica, 4-hour drive from San Jose. Designed by Arnold Palmer, this 18-hole, par-72 championship golf course and member of the International Association of Golf Tour Operators (IAGTO) was designed with the resort golfer in mind and is ranked among the "Top 100 Courses Outside the United States" by Golf Digest. Your golf experience begins atop one of Peninsula Papagayo's highest plateaus, overlooking the jeweled waters of Bahia cite; a de Culebra. Spectacular water views await you at 14 of the 18 holes. The signature hole, number 6, El Bajo, features a dramatic 446-yard par-4 with a tee shot that plays 61 metres (200 feet) downhill to a receptive valley-shaped fairway. The green is perched out on a cliff with the ocean behind it, and your round will culminate on the scenic 18th green, with views of the Pacific Ocean and Bahía de Culebra. Location: Northwest Coast of Costa Rica, 4-hour drive from San Jose. The Golf Course at Hacienda Pinilla offers one of the finest settings for links enjoyment in a country renowned for its golf tradition. Created by respected architect Mike Young, the layout conforms gracefully to the natural flow of the land, weaving through the tropical forest along the shores of the Pacific to provide an unparalleled blue water backdrop. The par 72 course Championship style course was designed to enhance the natural landscape of Hacienda Pinilla, giving golfers an exceptional and immaculately conditioned place to enjoy a round with family and friends. Location: Northwest Coast of Costa Rica, 4-hour drive from San Jose.